The person who developed Aikido is Morihei Ueshiba (1883-1969). He was the heir of an ancient samurai family from the Wakayama Prefecture. His father has been a martial arts teacher. As far as the life of Ueshiba Junior is concerned, its beginning resembles the lives of so many martial arts masters who had lived before him. 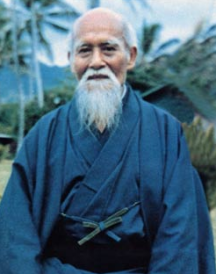 Ueshiba has been short and skinny in stature and with an ailing disposition. His childhood dream has been to become a physically strong man. Upon becoming thirteen years of age, he started practicing Jujutsu under the leadership of Tokusaburo Tozawa, a master of the Kito-ryu style. Following his teacher’s advice, Ueshiba paid special attention to the improvement of his physical fitness. Soon he has strengthened his body so much that he has become as strong as a bull. His body height was only 1.55 m, while he weighted 74 kg. However, Ueshiba has not been satisfied with the knowledge of Jujutsu he had mastered. His eagerness to learn more made him travel around Japan in search of new styles. He has continually been taught different styles and directions and he undoubtedly mastered all their techniques. 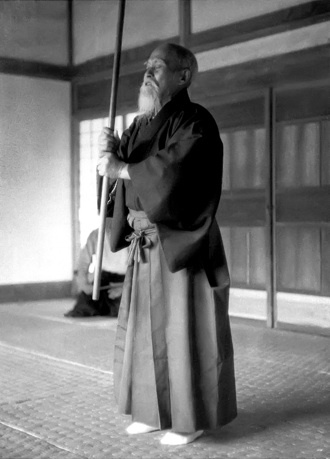 Hozoin-ryu, Yapo-ryu, Daito-ryu – these are the names of the martial arts styles that have influenced Ueshiba immensely while he had been drawing his own specific conclusions. Parallel to Kempo, he has also practiced katana swordsmanship and spear mastership (Hojutsu). He has been a great achiever in both. 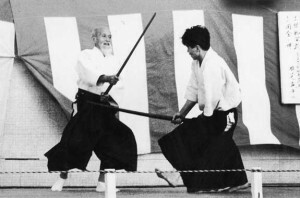 The celebrated sword master from the Yagyu School – Masakazu Nakai, has been his sword fight teacher. The masterships of the art of the sword and the art of the spear have played a major part in Ueshiba’s further life as they have enriched the technical arsenal of Aikido created by him. During the swirl of the Russo-Japanese war, Ueshiba joined the army as an ordinary soldier. He fought in the blood-soaked fields of Manchuria. Upon his return to Japan, he suffered from poor health, hovering between life and death for several months. Eventually, his toughened body has overcome the illness. Then he has again started his roaming around Japan in search of the highest wisdom of Budo. He spent much time and efforts learning Kansetsu-waza – painful joints lock techniques and arm locks. At the age of 27, in his capacity of a mature martial arts master, he moved home to Hokkaido to the North of the country. At the dawn of the 20th century, Hokkaido was a luscious green and poorly inhabited island lying in the outskirts of human civilization. His moving residence to the island caused a radical change in Ueshiba’s destiny. He has been enrolled to study with Sokaku Takeda – an heir of a distant branch of one of the most ancient aristocratic families and a keeper of the tradition of the exoteric school of Kempo called Aizu-Todome (secret techniques). 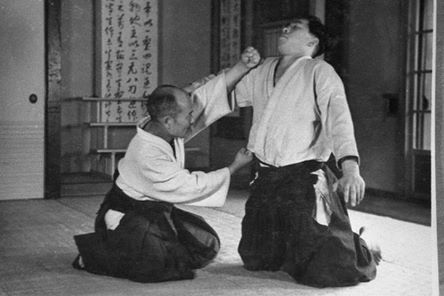 There Ueshiba has studied Daito-ryu. Modern Aikido has expanded outside the borders of Japan and has enchanted the world due to the efforts of Ueshiba and his successors. It stems from the ancient art of concentration of the vital energy ki of the Daito-ryu Aiki-jujutsu school. Like many impoverished aristocrats, Sokaku Takeda had been sticking to his previous ambitions and even magnifying them by his self-interest. The access to his school was possible only for the successors of rich and celebrated families. By the time Ueshiba met Takeda, he could only boast his samurai background and no family wealth at all. 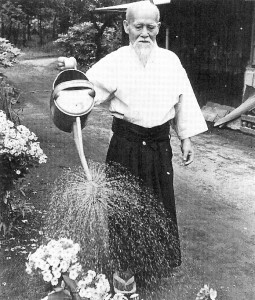 To earn the benevolence of the master, Ueshiba had to work as a slave with Sokaku Takeda’s home and to do the hardest chores for free. Besides, he had to pay between 300 and 500 yens (depending on the complexity of the technique) to his teacher for every new technique that he had learned. 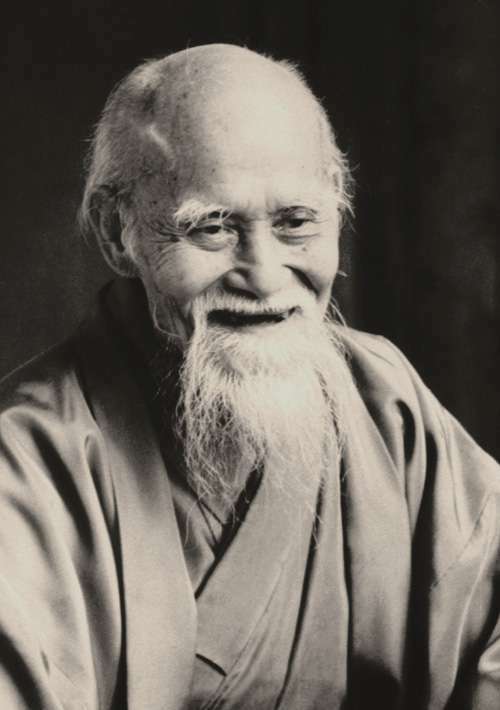 Ueshiba himself has testified that his teacher had spent no more than 100 days out of 5 years for Aiki-jutsu practice. What helped him to reach the top achievements of the diligent students were his experience, his excellent physical fitness and his ability to devote himself. In 1916, at the age of thirty-three, Ueshiba had been awarded a diploma and he left the island of Hokkaido soon after. Returning back to central Japan, he had to devote his time to care for his father whose health had deteriorated. By this time, in the tiny town of Ayabe near Kyoto, he had met Onisaburo Deguchi – founder and leader of the new trend in the Shinto religion – the Omoto-kyo (the teachings about the Great Origin). Onisaburo Deguchi has been a prominent martial arts master who had been consecrated into the secrets of the legendary Japanese mountain ascetic hermits yamabushi from the Middle Ages (mountain-wandering warrior monks). The unity of ki with the universe should be a result of strenuous creative explorations, sustained efforts and extended contemplations. The Japanese call that moment of unity satori. This is how Morihei Ueshiba describes satori which he managed to reach after long years of efforts, mortification of the flesh, fasting and meditation under waterfalls. This happened in 1925 when his ascetic time had expired and the ascetic hermit had moved to live in the town of Ayabe. “Once I was taking a walk in my garden and suddenly the earth trembled. Golden vapor welled up from the ground and engulfed me. I felt transformed into a golden image and my body seemed as light as a feather. At the same moment I felt the light with all my body and soul and I think I started to grasp the language of the birds chirping around. It seemed that at once I could feel the intentions of the Divine that has created the Space. And then a thought stroke me: martial arts are the love of the Divine! From that moment on, and for my entire life, I understood that the whole world was my home and that the sun and the stars belonged to me. The high social status, the fame, the honors and the wealth – all these lost their meaning for me forever. Real martial art should have nothing in common neither with the rude physical strength which is needed only to down the opponent, nor with any lethal weapon since both of these do lead the world towards destruction. Ueshiba has developed his thoughts which eventually have become the milestone in the philosophy of Aikido, from his claim that physical strength deteriorates with the years. Today’s champion could happen to be defeated tomorrow. That is why his today’s victory over his opponent is not an absolute victory but rather a temporary, a relative and a false one. For nature such a victory on the field of competition has no value. Thus he sees striving for a sports victory as an ostentatious display of conceit and as an exhaustion of the spirit that bring no benefit to the victor, nor to humankind. Real victory lies in mastering your own mind, your will and your emotions and in developing abilities to direct ki to its due course. Everything else is negligible. Victory on the battlefield will come by itself for those who have withstood the turbulence of their fragile human nature. Acting in unity with the Universe means being victorious. Ueshiba loved to represent the Universe, the earth and the man through the shapes of a square, a triangle and a circle. These shapes embody the idea of the Creation and the self-recreation of ki. The unifying link in the interactions between these three shapes is the cosmic energy – ki. While developing these ancient ideas, Ueshiba has also studied kotodama (the sacred sound) – the teachings about the power of sounds that stimulate Creation and that have their counterparts in the spacious picture of the world. These sounds symbolize the rhythm of the swirling breath of the Universe. Each aspect of existence has its own individual rhythm. Each aspect of existence pertains particular vibrations that unify the spiritual and the bodily essence. By studying the relationships between the aspects of the existence and the metamorphoses of the prime elements, a person reaches the Path (do) of the Universe where the invisible blends with the visible. In 1934, Onisaburo Deguchi gathered his followers and sympathizers and announced his intention to head for Manchuria where he planned to establish a kingdom of good and justice – an idea which had been too naïve for an educated public figure from 20th century! Besides, Deguchi succeeded to convince a couple of his followers including Ueshiba. Inspired by impossible dreams, they arrived in Manchuria. Deguchi’s offer was approved and accepted by the local dictator. He even granted funds for formation of the royal army of the future Japanese-Chinese-Manchurian kingdom. Soon after that the dictator suspected some kind of fraud and changed his mind. He cancelled the established army divisions, executed all the Chinese army officers and ordered the Japanese to be tortured until they tell the real purpose of their mission. A couple of days later a military squad urgently sent from Japan set the ill-fated utopians at liberty. Soon they returned to their country. The expedition which had started in the name of the implementation of the principles of Budo, had ended up in a shameful fiasco. In Japan Ueshiba has been warmly and honorably welcomed. His reputation has grown especially among the senior military officers from the army and the navy. The famous admirals Isamu Takeshita, Sankichi Takahashi and Hidesuke Yamamoto have enrolled as his students. However, Ueshiba has been too frustrated from the failure of his mission on the mainland. The disappointment made him change his place of residence. He settled in the mountains of the Ibaraki Prefecture, in the small town of Iwama. There he officially opened his first Aikido Kobukai School in 1938. For twelve years on end, Ueshiba lived in isolation among several of his faithful students. Wars did not allure him anymore. Ueshiba has spent his days and nights in meditation and exhausting training which had led to brilliant results. His mastership continually improved. At the age of 60, he could easily defeat several armed opponents by use of almost no force and by moving quickly and graciously. The defeat in the war has brought strenuous hardships to the Japanese people. Ancient moral values were being destroyed. The American occupation authorities made their best to eradicate the samurai spirit of the Japanese. When the ban on practicing martial arts was removed in 1948, Ueshiba decided to announce the secrets of Aikido to the public so that people could feel strong and confident in their unity with nature. 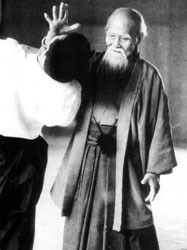 His immediate successor was his son – Kisshomaru Ueshiba, who devoted his life to the spreading of Aikido. Morihei Ueshiba, who viewed Aikido as “the demonstration of the universal love”, taught his students to seek no victory in battle but rather their unity with their opponent in compliance with the principle of mutual attraction and repulsion of the two primary basics yin and yang. The extremely complex Aikido technique cannot be described in a short report. We cannot imagine it by its description. Ueshiba claimed that there are no particular forms or styles in Aikido and he compared the secret of his teachings to the mysteries of the Universe. He had never acquiesced Aikido to be practiced as sports. What he demanded from his students, had been profound self-knowledge. The heritage of Ueshiba is alive today in the trinity essence of the martial arts – Shingitai, where the spiritual and the physical qualities blend into technical excellence.